Several people have asked about our next trip to Costa Rica. I thought I’d give you a short look at the trip here. We have three openings if you’re interested. Black-bellied hummingbird, Eupherusa nigriventris, male, Central Highlands, Costa Rica. Coppery-headed emerald, hummingbird, Elvira cupreiceps, male, Central Highlands, Costa Rica. Fiery-throated hummingbird, Panterpe insignis, in Costa Rica. Green-and-black Poison Dart Frog, Dendrobates auratus, Central Highlands, Costa Rica. Please remember that you can email me at any time if you have questions. Strabo Photo Tour Collection coordinates this trip. Call Jacque at Strabo to register. Her number is 607-756-8676. Our group is comprised of photographers, birders, bird photographers, and nature lovers. Gary and I love this type of a group because it covers all our passions. I will look out for things to photograph. I’ll point out subjects, offer suggestions on camera settings, and offer congratulations when you get a great shot. Gary will focus on the birds but he’ll never pass up a nice frog, lizard, snake, or view. We allow you to direct your attention either way. We’re both nature lovers with a particular love of Costa Rica. Our trip begins in San Jose where it will be temperate and comfortable. The first stop will be at La Paz Waterfall Gardens in the cool mountains. Here we’ll photograph high-mountain hummingbirds such as the black-bellied hummingbird and coppery-headed emerald. Our day ends in Sarapiqui where we enter a different eco-system. The humidity will increase along with the temperature. The variety of wildlife will also increase. There are several places we’ll visit in the Sarapiqui area. We should see and photograph strawberry poison-dart frogs, green-and-black frogs, three-toes sloth, broad-billed motmot, buff-throated saltator, and cinnamon woodpecker. We’ll stay at the SuenoAzul Resort where we’ll see and photograph birds, monkeys, frogs, and maybe a bat or two. Gary and our guide Willy Alfaro will lead bird walks around the grounds and into the surrounding forests. Stay with me or take a walk with Gary. We leave that up to you. One day we’ll visit La Selva Biological Station. Walk the jungle, see birds feeding in trees, and experience a real research facility. Our next stop will be a completely different eco-system at Savegre Mountain Lodge. Gloves might be in store if you’re cold natured. Another day we’ll visit Sarapiqui Eco-Observatory Super easy bird photography from an incredible photo blind. We’re inside in comfortable chairs and drinking coffee while the birds visit fruit feeders outside. Perfect for photography and bird watching. Our daily activities will continue at the same pace. Birders can go out into the gardens for a pre-breakfast walk and look for birds high in the canopy or deep in the forest. Photographers might want to stay with me for hummingbirds at the feeders around the dining room. Savegre is our best place to see and photograph the resplendent quetzal. This is our target bird. We’ll stay together as a group during our hunts for this magnificent bird. The overall trip has several changes in elevation. San Jose is moderately high for people used to living at sea-level. Sarapiqui is lower but then Savegre will take us to 7,000 feet. I’ll carry at 100-400mm lens most of the time. This is equivalent to Nikon’s 80-400mm lens. Both are great for birds, monkeys, and sloths. The birds and hummingbirds we’ll see can be photographed with a 75-300mm lens or a 70-300mm lens. A 70-200mm would work well if you added a tele-extender. It’s not necessary to bring a 500mm or 600mm lens on this trip unless you want to carry the weight. We’ve designed the trip to visit place where we can get close to birds and wildlife. Email if you have questions. This will be our 15th year leading photo/birding tours to Costa Rica. I hope you’ll join us on this trip. I’ve written about bokeh — or lovely blurred backgrounds — in previous posts. 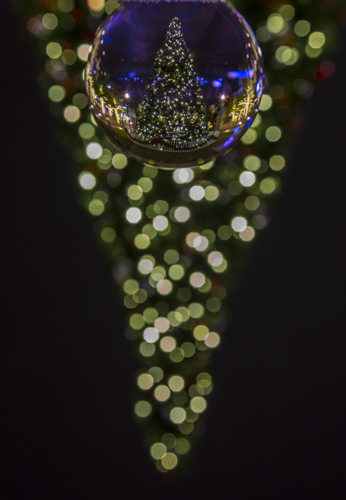 Now, let’s toss in a crystal ball to create something different. 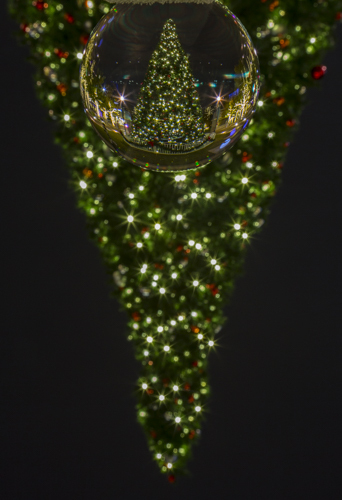 Christmas tree photographed through a crystal ball. I used f/22 to get the starburst on the lights and tiny sparkles in the background. 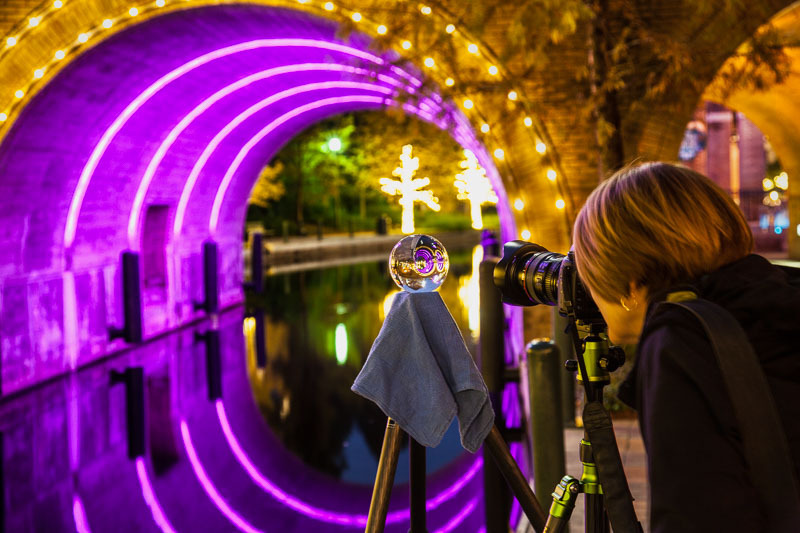 bridge through the crystal ball. 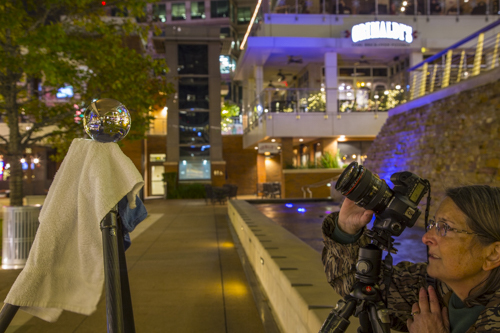 We’ve placed the crystal ball on a towel on top of a tripod. This is a small ball that fits in the palm of your hand. You’ll need to get closer or crop. This weighs 4.7 lbs and is the size of a small cannonball. It’s easy to fill the frame with a 100mm lens. Here’s lessons learned and observations. 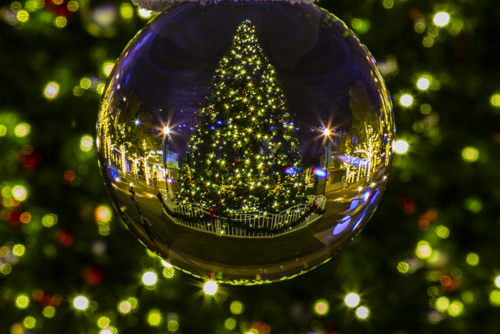 All images have been flipped to make the scene inside the crystal ball appear normal. I used f/22 to make the edge of the crystal ball crisp and clear. That gives smaller circles of light in the background. 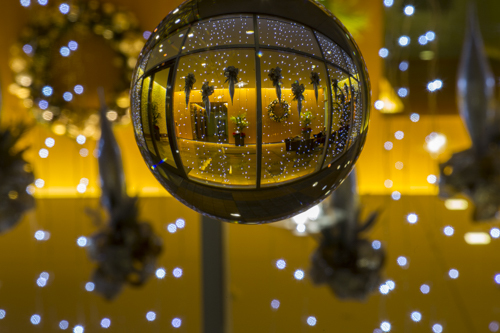 I used f/6.8 and that makes the edge of the crystal ball soft. The lights in the background are larger and softer. 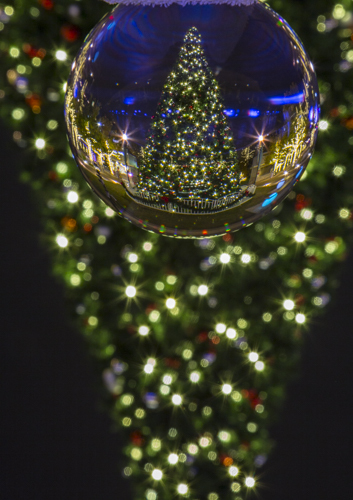 The view through the crystal ball can be captivating to the photographer. Stay mentally focused on what you’re seeing through the ball. The image through the ball is okay but a bit confusing. f/22 to get starbursts on the lights. 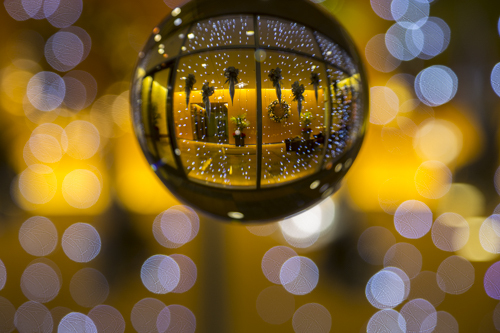 A cleaner view through the crystal ball. We changed our position to the tree to get a simpler composition. Canon 24-105mm lens at 105mm. Including the entire tree in the background. f/22 to get starbursts on the lights in the background. Same as above but using f/6.8 to get a nice bokeh. More photos from our outing with the crystal ball tomorrow. Questions or comments? Feel free to post them below. 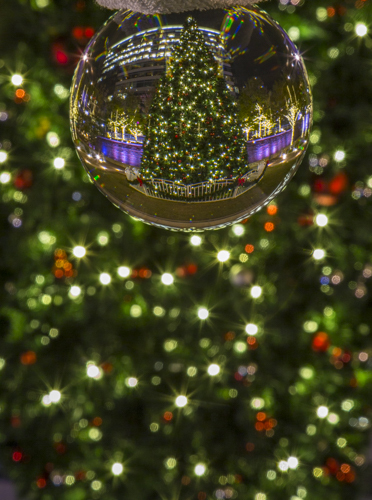 Breathe new life into your holiday ornaments by making them the star of your photographs. All were photographed using f/4 to soften the background. The lights in the background are 5-feet away from the ornaments. Lights are held to the wall with clear thumbtacks.